This magnet measures approximately 2x3 inches and the image is made entirely of text! 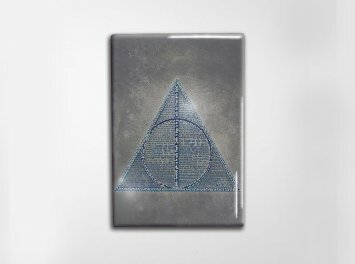 The image shows The Deathly Hallows symbol made from quotes from Harry Potter and the Deathly Hallows Part One. Please note the text is small on this magnet. For more reading fun, check out our 11x17 art prints, or poster size print.